With updates designed to further enhance the most recognized and capable vehicle in the world, the 2015 Jeep Wrangler is a great contribution to the iconic vehicle's history. New features for 2015 include a standard eight-speaker stereo or available updated Alpine premium standard with a subwoofer. The Rubicon Hard Rock editions for 2015 features an Alpine stereo and black grill. In addition, the wrangler comes equipped with a standard Torx toolkit which aids in removing roof, doors, and bumper end caps; the Sport models offer 16-inch black steel wheels and 31-inch off-road tires. Read on for more information, and if you have any questions, call us (888) 893-4107, or visit our showroom located at 460 Yarmouth Road in Hyannis. Jeep's Wrangler is fully equipped to handle both off-road and on-road driving, with Chrysler Group's award winning 3.6-liter Pentastar V-6 engine, which delivers 285 horsepower and 260 lb.-ft of torque; perfect for extreme off-road conditions. Customer shave the option of a six-speed manual or five-speed automatic transmissions, and four-wheel drive is standard. 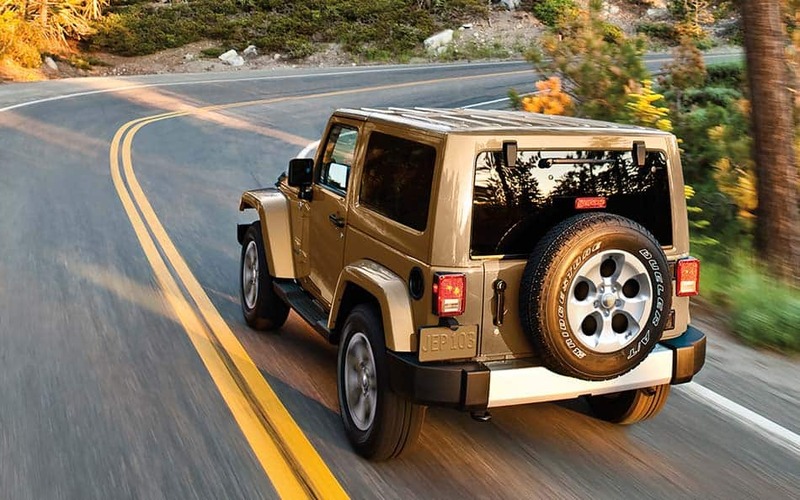 The Wrangler is available with a towing package featuring trailer-sway control, an electronically disconnecting front stabilizer bar, and dual locking differentials. Coming standard are solid rear and front axles and underbody skid plates. The Jeep Wrangler comes in numerous trim packages, including the Rubicon Hard Rock Edition, Willys Wheeler Edition, and Freedom Edition. Interior highlights include multiple standard features; cloth upholstery, floor console with rear and front cupholders, locking storage bin, CD stereo with MP3 jack and many available features, including heated front seats, air conditioning, power locks and windows, Alpine premium stereo, and a navigation system. The exterior recalls Jeep's classic rugged appearance, and the Wrangler offers features that will enhance any off-road experience, including removable side doors, fold-down windshield, fog lights, 16-, 17- or 18-inch aluminum wheels and a full-size spare tire with matching wheel mounted on the Wrangler's rear swing-gate. Available exterior features include tubular side steps,and hardtop removable overhead sections. Advanced technology, featuring the best-in-class Uconnect system, keeps a driver connected to the outside world in a safe manner. The 2015 Jeep Wrangler put an emphasis on making a safe vehicle fr exploring, and is engineered to improve handling and accident avoidance. The Wrangler is available with an assortment of safety and security features, including standard electronic stability control, trailer-sway control, electronic roll mitigation, brake traction control and Hill-start assist. The Wrangler was created to be a car that customers can feel safe taking on adventures, and the 2015 model only adds to that priority with additional safety, security and technological features. Learn more about this model on the Official Jeep Wrangler Website.